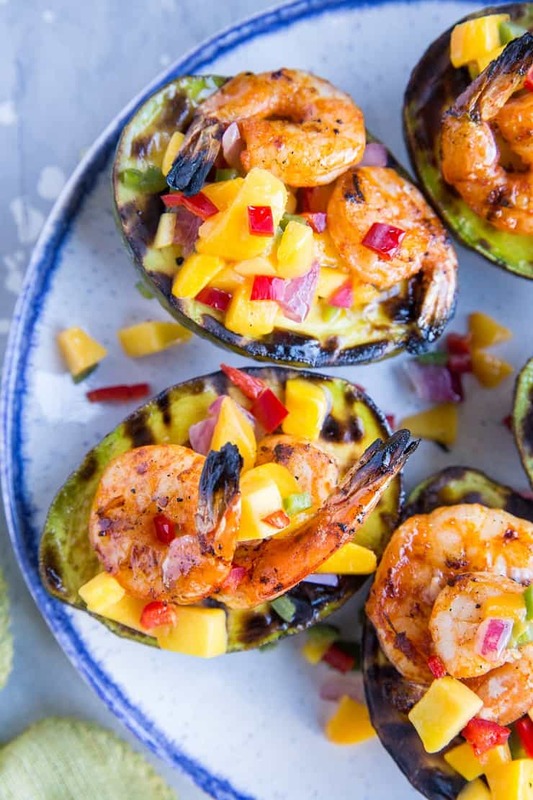 Stuffed grilled avocados with grilled shrimp and delicious mango salsa. These stuffed avocados are perfect for sharing with friends and family all grilling season long. Have you fired up your grill yet? We had a pretty mild winter here in the Sierra Nevada, so we’ve been grilling since the end of March. Pretty obsessively, I might add! 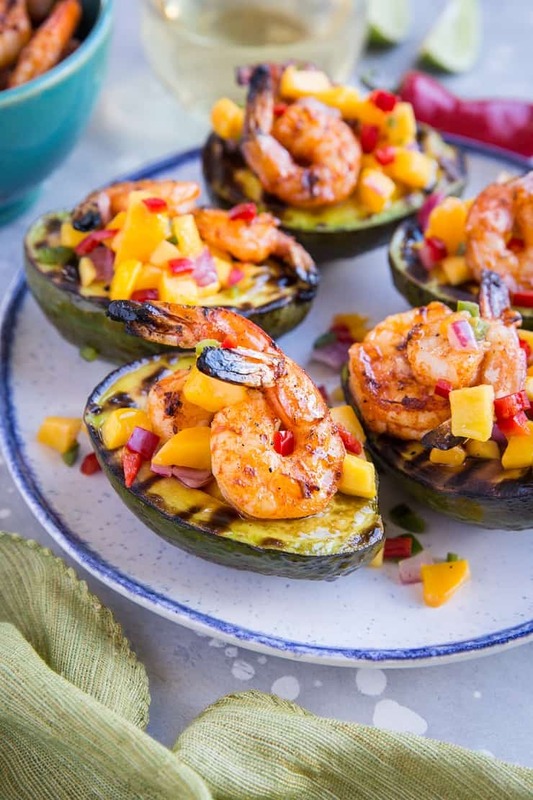 In preparing for grilling season, I’m offering up a sharable appetizer or side dish for serving guests at your summer barbecues: grilled avocados stuffed with grilled shrimp and mango salsa! First off, have you ever had grilled avocado? It has that smoky flavorful char and gets a little bit of a crust, while the remaining flesh is a warm creamy bliss. If you’re concerned about what avocado is like warm, trust me on this one…it’s just as mouth-watering warm or hot as it is at room temperature. I still make the 30-Minute Green Curry with Avocado I showed you last year regularly – as it turns out, avocado is marvelous in curry! The caveat to grilling or cooking with avocados is you do want them somewhat firm…not too under-ripe, but a little firm to the touch so that they hold together well during the cooking process. Okay, so now that we have our avocado details in order, let’s discuss the rest of the recipe. Aside from the grilled California Avocados, I also grilled up some shrimp and whipped up a mango salsa for some epically flavorful stuffage. 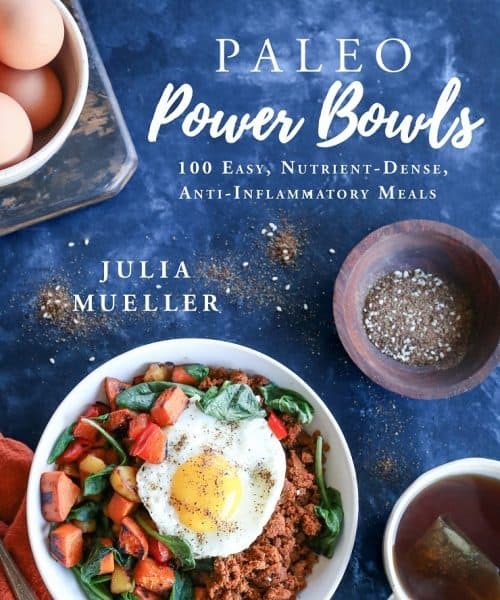 All parts added together make for a fun and vibrant crowd-pleasing appetizer that happens to be healthful and super easy to prepare! 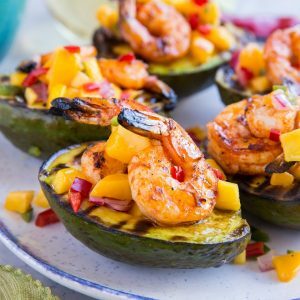 You have the smoky flavor from the barbecue, the crunch of the shrimp, the creaminess of the avocado, and sweetness and heat from the mango salsa. It’s a basic thing of beauty. If you don’t own a grill, you can still make this recipe by leaving the avocados raw and sauteeing the shrimp on the stove top – this is still a delicious option! Lack of grill isn’t an issue here! One last note: You can absolutely substitute pineapple or even strawberries for the mango to change up the salsa option. Preheat the grill (fire up the coals or turn on the grill) to a medium-high temperature. While the grill is preheating, add all ingredients for the shrimp to a sealable bag and shake well to combine. Coat the flesh side of the avocados with avocado oil or olive oil and sprinkle with sea salt. Place avocados on the grill cut-side down. Grill 2 minutes, flip, and grill another 2 minutes. Place grilled avocados on a plate and set aside. Place shrimp on the grill and cook until grill marks appear, about 2 to 3 minutes. Flip and continue grilling another minute or two, until shrimp are cooked through. Transfer shrimp to a plate. Stir together all ingredients for the mango salsa in a bowl. 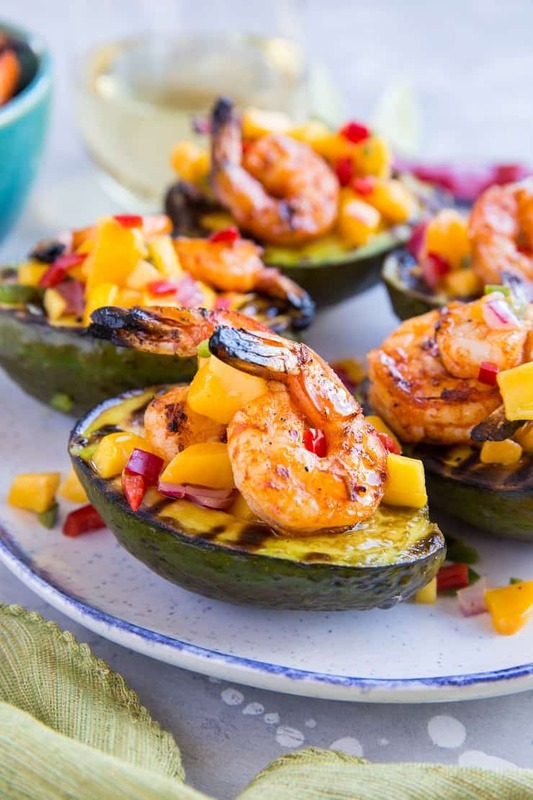 Stuff each avocado half with mango salsa and top with 2 or 3 grilled shrimp. Serve and enjoy! Note: you will have leftover shrimp, which you can place in a bowl and serve to guests who want more. The mango salsa looks like the perfect topping to these avocados!! So fresh and flavorful. Mangoes are great grilled too! Never tried grilled avocado, I’m so excited to to try this! Thank you! I grill year round but really started firing it back up in March too! I’ve grilled avocado once and truly need to revisit that. I’m loving all of the deliciousness you’ve stuffed into these avocados! These look so fantastic! I love the idea of avocado boats!